This guide helps readers to engage with the major critical debates surrounding literary modernism. A judicious selection of key critical works on literary modernism Presents a critical history from the earliest reviews to the most recent theoretical assessments. Shows how modernist writers understood and constructed modernism. 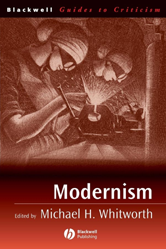 Shows how succeeding generations have developed those constructions and brought new interpretations to bear on the subject Discusses how modernism relates to modernity and modernization, and to other literary and cultural movements Texts have been selected for their relevance to the questions surrounding modernism, and for their accessibility to readers with a limited knowledge of the modernist canon.